You'll want to grab a life jacket and an extra large popcorn for tonight's show. Here we discuss the film adaptation of In the Heart of the Sea, based on the National Book Award winning history by Patrick Philbrick. Based on actual events, the story follows the whaling ship, Essex, as she takes on a crew and sets out from Nantucket in the early 1800's. Bound for the plentiful whaling grounds of the Pacific on a journey considered commonplace in its day, the crew encounters terrors that will test them to their limits. 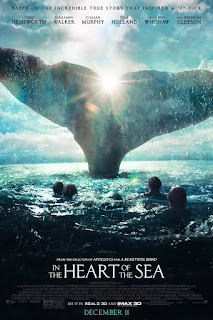 Directed by Ron Howard and featuring a cast led by Chris Hemsworth, In the Heart of the Sea is the kind of adventure you wish wasn't true.